When life gives you a hangover, make Bloody Marys. That’s how the saying goes, right? The Bloody Mary is a nutritional breakfast cocktail and hangover cure all in one. Traditionally it is a tomato-based drink but has hundreds of variations. I recently bought a slow juicer and perfected the recipe for my own variation, the Spicy Beet Bloody Mary. Beets are earthy, gorgeous in color, and they make an incredible addition to your Saturday or Sunday morning hair of the dog. Juice four beets through a slow juicer. In a blender combine all ingredients for the Spicy Beet Bloody Mary Mix and process until smooth. Taste and add any extra seasoning it might need to your preference. I like extra horseradish and hot sauce! Transfer to a container and refrigerate until thoroughly chilled, at least two hours or overnight if possible. When ready to serve, fill a pint or highball glass with ice. Add 1 1/2 oz. vodka or spirit of your choice (I love gin for a Red Snapper or tequila for a Bloody Maria), then fill the glass with the Spicy Beet Bloody Mary Mix. Stir well and garnish each glass with your favorite veggies. I like classic garnishes like celery, lemon and olives, but you can get creative! The next time you’re hungover or boozy brunching at home, don’t settle for just any ole tomato juice mixture for your Bloody Mary. 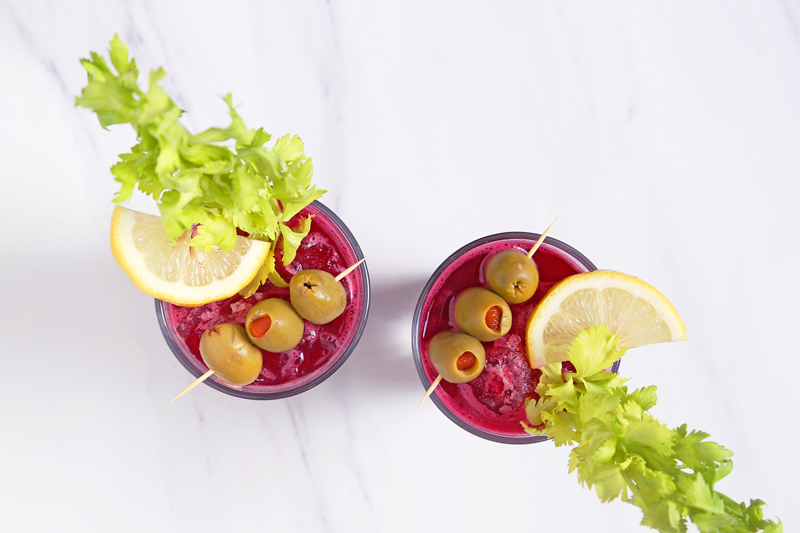 This Spicy Beet Blood Mary is earthy, rich and gorgeous in color. Besides the color, the beets give the drink a subtle sweetness. It balances with the bite from the alcohol and spiciness from the hot sauce and horseradish perfectly. It’s a great excuse to drink your veggies and add some extra health benefits to your alcohol intake too! I hope you’ll be trying this one out at home soon. Cheers everyone and happy hangover!